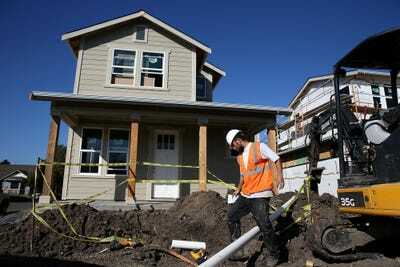 Justin Sullivan/GettyA worker prepares to move a piece of pipe into place as he build a new home on January 21, 2015 in Petaluma, California. Richmond Fed President Thomas Barkin is worried policymakers may lack the tools to deal with the next recession. With that in mind, he says, looking for ways to strengthen US labour-force participation could create a crucial buffer before the next downturn. The Federal Reserve may have limited tools to deal with the next recession, making it imperative that policymakers find ways to further strengthen an already much-improved labour market before the next economic downturn, Richmond Fed President Thomas Barkin said in a speech Wednesday. In particular, Barkin is focused on ways of further beefing up the labour market, which has seen the unemployment rate drop sharply from a Great Recession peak of 10% down to just 3.9% in July. How can policymakers do this if the job market is already running hot? Barkin cites low labour-force participation as a sign of continued fragility. Barkin, who is a voter this year on the Federal Open Market Committee, was broadly supportive, if cautious, about ongoing interest rate hikes from the Fed, the next of which is expected in September. “When the economy calls for moving back to normal levels, as do the conditions I just described, we should follow through,” he said, adding that “how high rates will ultimately need to rise depends on economic growth: The higher the underlying growth prospects, the higher the policy rate.” The current range for the federal funds rate is 1.75% to 2%. Still, he emphasised other things economic policymakers, including the Fed, Congress, as well as state and local governments can do to improve outcomes across a wider spectrum. US labour-force participation was already on a steady decline in the run-up to the Great Recession of 2007-2009, but the decline clearly accelerated during the slump. It has yet to rebound in any noticeable way.